The children decided that the wolf only ate Red Riding Hood because he was hungry. 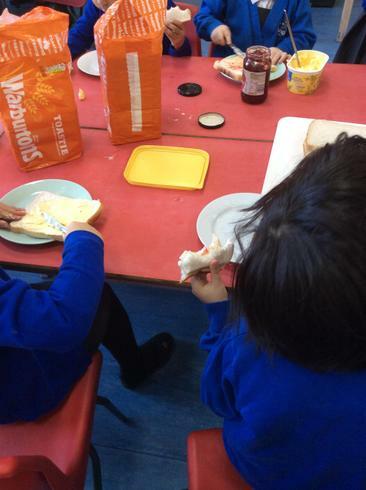 They decided to make him a strawberry jam sandwich to stop him eating any one else. Let’s hope he doesn’t come back! This term, our topic is all about "Dinosaurs,"
The children will be using I-pads, books and laptops to research facts about dinosaurs We are also going to be writing about them using our phase 2 and phase 3 phonic sounds. To support your child with this, you can use this link to see a range of captions and sentences that we will be using with your child. Welcome back! We hope you all had an enjoyable half term. Next week (12th November) we will be introducing our next topic which is all about journeys and transport. On Monday as an introduction to the topic we are inviting your child to bring in their own wheeled vehicle to school for the day. This may be a bike, trike or scooter. Please find attached a video of the book we will be looking at next week ‘The Train Ride’ please watch it with your child and have a think about anytime you have been on a train or a journey somewhere. Next week we will be learning about harvest and it’s meaning, we will be reading the story A Scarecrows Wedding by Julia Donaldson. We will be exploring vegetables and doing some cooking! Please can you have a talk with your child about a wedding they may have attended, as we will be sharing our experiences. Attached is a video of the book we will be learning, please share with your child. 😀. Also have a look at the phonics video to help your child with their sounds and to support you to understand more about how it is taught. Next week we will be sharing the story ‘Funnybones’ we will be looking at and labelling parts of our bodies and exploring shapes. In preparation for this please share the story with your child. PLEASE ensure that all your child’s belongings are labelled, this will help us immensely at home time to ensure children are leaving with correct items. 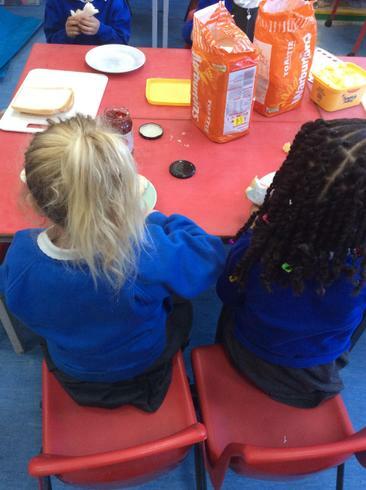 We are encouraging the children to become more independent, please help by supporting them at home to dress themselves, put on their own coats, and become more independent at mealtimes. Parents eveing slots are still available, if you wish to see a teacher, please book a slot for Wednesday 17th October 3.30-6.30pm. Please be patient on the door at drop off and pick up, as our first priority is to ensure that the children come in and leave safely. If you wish to speak to a teacher then we will see you as soon as is possible. We are collecting items for our mud kitchen, if you have any old pots/pans/spoons etc please drop them in at the door. 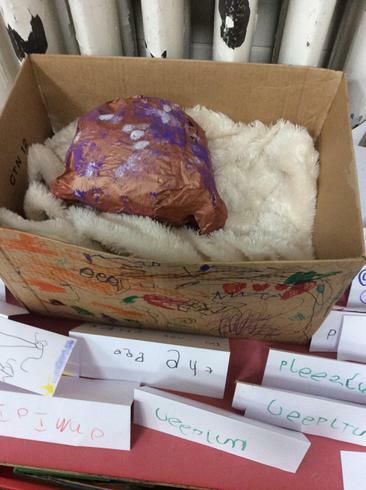 Our new topic is called "what's in the box!" Each week a new item will be placed in the box to introduce the learning for that week. Next week (24.09.18), we will be sharing the story of Owl Babies and linking this to finding out about our own families. To prepare your child for their learning, can you please click on the link below and share this story with your child. Please learn this song with your child. We are so excited to meet you all and we hope you are looking forward to starting with us next week. Please check your times for the first week to ensure you know when your child needs to be with us! If you have any concerns or wish to speak to a teacher please feel free to ask. Check back soon for exciting news and games. Next week ( 21.05.18) Reception will be reading and creating our very own poem. The challenge is for your child to find out what a poem is .... rewards will be given. During our maths lessons, Reception children will be continuing to develop their addition and subtraction skills. We will be using practical activities to support this and squared paper to record our number sentences on. Don’t forget our Reading, Writing and Phonics workshop on Wednesday 7th March at 9:00. Just a quick reminder that the first day back after the holidays - Monday 26.02.18- will be patterned day (only Reception children) Could your child please wear clothing with a pattern on ready to introduce the concept of patterns. It can be any pattern at all, and as simple as a patterned pair of socks. Next term, our learning will be based around the topic ‘Fairy Tales’ The first week back, we will be going into the woods to have the story ‘Red Riding Hood’ read whilst sitting in the outdoor classroom - I hope we don’t see any wolves!! This term Reception are going to be learning all about Dinosaurs. 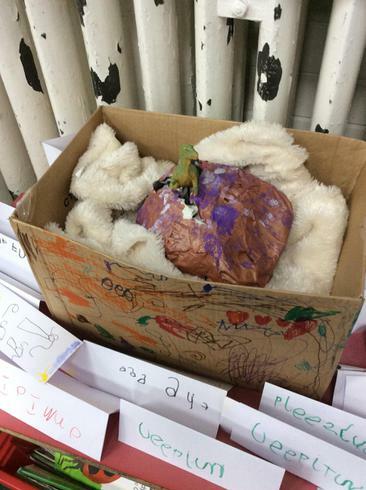 The children were welcomed back after the Christmas holiday by a strange looking egg! They decided to place the egg in a box with a warm blanket and keep it warm by putting it next to a radiator. 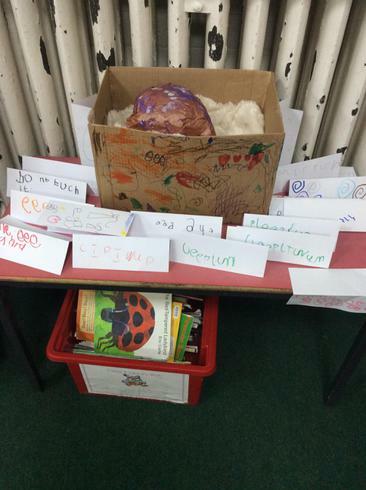 Next, the children wrote messages on how to look after the egg. Reception classes had a great time at West Midlands Safari Park. We saw lots of animals and visited Father Christmas in his grotto! 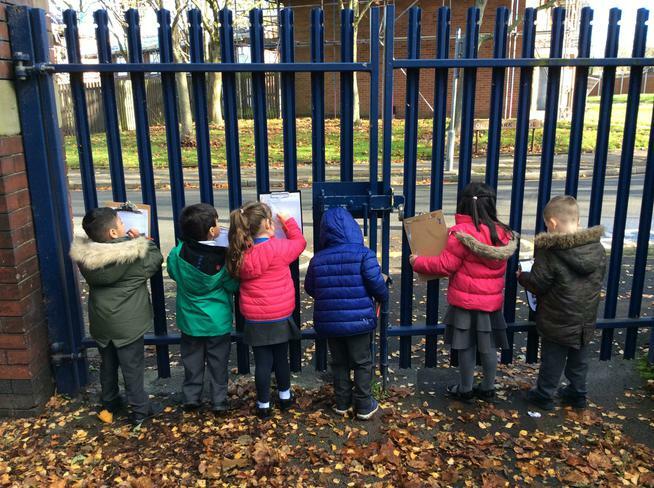 The children created their own tally chart by counting the different types of vehicles that passed by the school gates. What a busy day we have had in Reception! 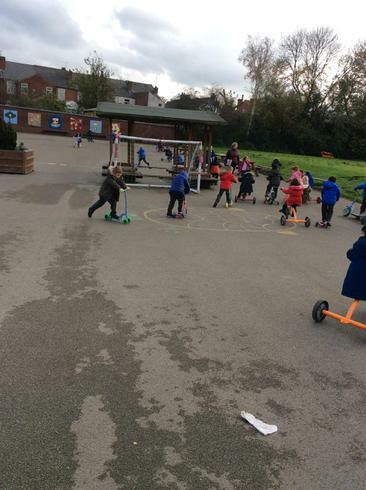 Thank you for sending in so many wonderful vehicles, the children have had so much fun playing on them. 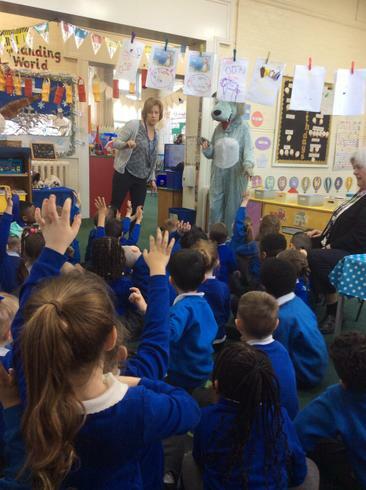 The children really enjoyed The Bumblebear visit! Could you please share this story with your child, to help prepare them for the learning that will follow. We had a lovely time on our Autumn walk! Next week (26.9.17) we will be sharing the story 'Elmer'. Do you know this story? The Crocodile Under the bed This is one of our favourite books. Today our butterflies hatched! We gave them some fruit and then let them fly away! For your learning logs in the holiday, please can you write one or two sentences of what you have been doing at home? You can stick in some tickets, leaflets or photos too! We have been watching our tadpoles grow this week. We took our tadpoles back to their home in our pond. Our caterpillars have spun their chrysalis, we are waiting for them to turn into butterflies. Can your child sing the Caterpillar Song for you?
' There's a tiny caterpillar on a leaf, wriggle wriggle. There's a tiny caterpillar on a leaf, wriggle wriggle. This week we have been watching our caterpillars grow. We have read the story of 'The very hungry caterpillar' by Eric Carle. We are still growing our beanstalks, for your homework please can you continue to look after your plant and record the changes in your Learning Log. Thank you. This term we are thinking about Growing. We will be reading Jack and the Beanstalk, and sending home a bean for the children to grow their own beanstalk. For their homework we would like the children to look after their beanstalk, and draw or write about any changes that happen to their bean. They can tell us how often they water it and where they have put the plant pot so that it gets lots of sunshine. Here are the beans we have planted so far. Our new theme is 'Once upon a time' We will be learning about different traditional tales. Can you draw a picture about your favourite book, it could be a character from the book or a picture of your favourite scene. It would also be great to see some writing telling us about your pictures. Please return your homework by Friday 17th March.